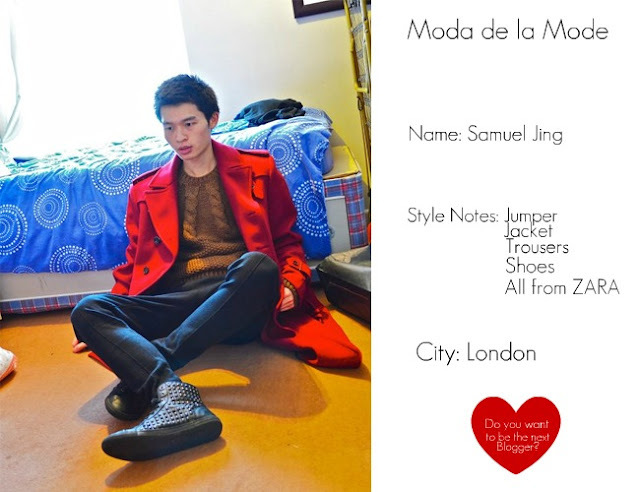 This week's Blogger Style features Samuel Jing from the blog Samuel Jing.He is the first male blogger to be featured in this section on Moda de la Mode and I hope he can encourage other male bloggers to share their style on Moda de la Mode. Samuel's outfit which is all from ZARA is based around the bright red of his coat. The colour acts as a building block on which the rest of the outfit can be constructed against. During the cold winter months, it is essential to brighten up the days through fashion and Samuel accomplishes this with great style.